Utube video banned! 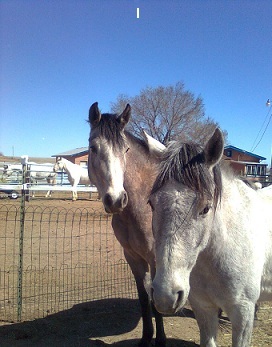 Just kidding, but these girls rock!Clara and Brisa are Iberian Sport Horse fillies. 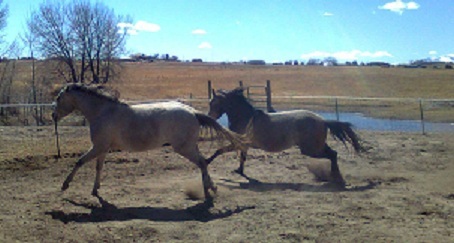 If you are going to do the Natural Horsemanship Two-Step with the fillies, get someone else to take the photos. Both fillies were born here and we started ground work on day one. For the uninitiated, this means conversing in ‘horse’ using body language, just like Mom does. It is an easy way to start a relationship that will last a lifetime. It should be the heart and soul of any riding discipline. Also takes multi-tasking to keep them camera distance away. It will be a warm weekend; I say spend it like a filly. But don’t get caught napping with a donkey.